Traditionally, jocks and musicians have been like oil and water. You’ve all seen American Pie’s Band Camp, right? Talk to any school band alumni and ask them about their relationship with the footy team. Probably not the very best of friends. Martin Novosel – (founder of Purple Sneakers and artist manager) and Paul Stix (founder of UNDR Ctrl) – are bridging the two worlds with Musica Copa. Interestingly, the merge of music and sport goes far beyond schoolyard truces – it’s the latest cross-industry marketing opportunity, and Musica Copa are – pardon the pun – ahead of the ball. Novosel tells TMN of his upbringing, in which his Croatian immigrant parents pushed him to learn musical instruments despite his early protestation. “First of all they made me play piano, and I wasn’t really great at it,” he remembers with a laugh. Apparently, he wasn’t so crash hot at the guitar, either. Drawing inspiration from similar music industry events in the UK, where they’d previously partaken in games against the likes of Basement Jaxx and Dizzee Rascal, he wanted to do the concept justice, “so not just like a kick-around-in-the-park. “We definitely wanted to make it something proper, like an institution that happens annually, that everyone looks forward to, and we wanted to do it with a purpose. Now heading into its 6th year, Musica Copa has raised well over $60,000 for various charities and is expanding to include 21 teams of blue-chip industry workers comprised of members from the major and indie labels, artists, major music brands like Spotify and MTV and more. “It’s a social day, rather than a competitive day,” he enthuses. The event garnered support from big brand names right from inception, thanks to the pair’s strong ties to companies like Nike through their other ventures – Novosel has been a Nike brand ambassador wearing his other hat at Purple Sneakers. And then that relationship evolved. Seeing the benefit of using artists as influencers, Musica Copa were selected by Nike to curate the musical component of their Socceroos Play Gold Campaign in the lead up to the World Cup. 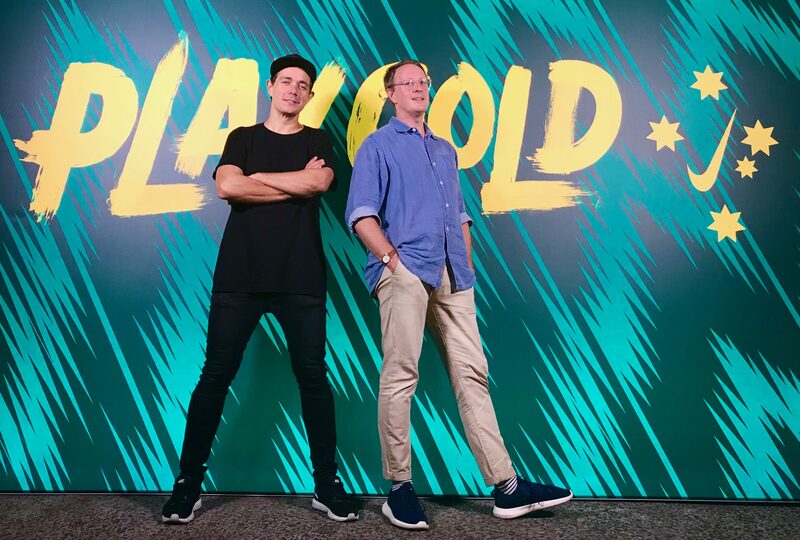 Nike’s brief was to find artists who were genuine football fans to perform at the Play Gold campaign launch event, and to roll out seeding the Socceroos’ jersey to musicians and influencers. “It was a natural evolution of our relationship with Musica Copa. The team are massive football heads and have amazing relationships with Australian musicians,” said Nick Atkinson, brand manager, Nike Football/Nike Pacific. “… Often finding out that someone is a massive fan or plays three times a week outside of music is tough to uncover, especially if they don’t ‘gram about it! Novosel added that, as a brand, Nike are very aware of the influence that creatives have. “This is me putting my marketing hat on,” he muses, “but if you keep sending the same message and drumming the same message into people, like, ‘Sport, sport, sport, sport, sport’, people over time will switch off. He explains that, despite the old stereotypes, the music and sporting worlds intersect more than we realise. We run with music, every gym or yoga class has its own playlist, big music acts are being booked to draw diverse crowds to every kind of sporting event, whether it’s the World Cup, the Olympics or the local races. “I feel like music has always been there. It’s more just about the industry side of things and the marketing side of things catching up to that,” explains Novosel. “Nike Football has always got to have a soundtrack and we know how important music is to the ballers, so mixing the two goes without saying,” adds Atkinson. Out of a shortlist of 20 acts, Montaigne, Peking Duk and up-and-comer, SIPPY, were chosen for the campaign. “SIPPY has been Nike Football’s DJ of choice for some time and we love her music and passion for football,” said Atkinson. Over 40 musicians also received personalised Socceroos jerseys in limited edition Play Gold boxes and headed along to the launch of the 2018 kit. “I think the commonalities are more interesting than the differences and show why the two worlds are so complimentary,” explains Atkinson. “Both music and sport deeply blend art and science, both are full of individuals striving to be the very best – both celebrate the power of teams, both are accessible to all, both industries are powered by diversity, and both worlds are responsible for creating some of the most important cultural moments in history.